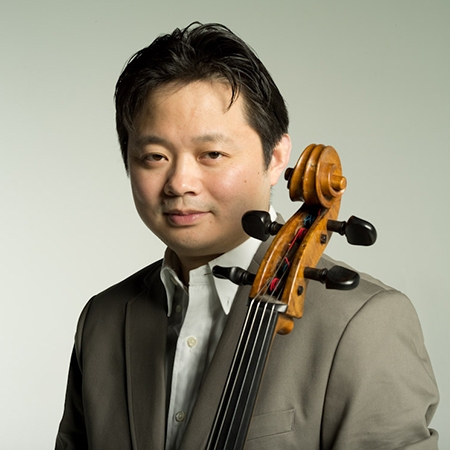 Bo Peng holds a Bachelor of Music in Cello Performance from the University of North Texas, a Master of Music from the Eastman School of Music, as well as a Performer’s Diploma from the Indiana University where he studied with distinguished cellist Janos Starker. His teachers also included renowned cellists Steven Doane, Carter Enyeart , Marc Johnson and Eric Wilson. Mr. Peng was a two-time winner of the Music Teacher National Association Competitions (Strings Division); he also won 3rd prize in the International Chamber Music Competition held by the Czech Radio “Spring of Prague”. As a soloist and chamber musician, he attended several summer festivals and master classes including International Summer Academy at University Mozarteum (Salzburg, Austria) on the Johann Strauss Foundation (2002 and 2003), the Banff Summer Festival, the Spoleto Summer Festival, the Taos Chamber Music Festival and the National Arts Center Young Artists Programme where he worked with world-class musicians such as Lynn Harrell, Gary Hoffmann, Aldo Parisot, Pinchas Zurkermann and the Tokyo String Quartet. In 2003, Mr. Bo Peng toured as member of Vancouver Piano Trio to Japan performing concerts and teaching Master Classes. In May 2005, he performed in the Shanghai premiere of Messiaen’s “Quartet for the End of Time” with clarinetist Gene Ramsbottom. In December, both of them worked together again for a Chamber Music Concert with local musicians in Taiwan. Being a founding member for Vancouver Trio with Clarinetist Gene Ramsbottom and Pianist Keiko Alexander, Mr. Peng has been performing regularly in Universities and Chamber music Series in B.C since 2006. In February 2008, as soloist Mr. Peng played Dvorak Cello Concerto with Richmond Orchestra and Chorus. In November 2009, he performed Beethoven Triple Concerto in Vancouver with pianist Eugen Skovorodnikov and violinist Victor Kuleshov. In December 2009, Mr. Peng performed with Stradivari Ensemble of the Vancouver Academy of Music’s debut as soloist with director and violinist Robert Rozek. In February 2010, Mr. Peng was feature soloist with Vancouver Philharmoic, performing the Dvorak Cello Concerto. In the summer of 2010, Mr. Bo Peng was invited by Quanta Culture and Education Foundations touring with Robert Rozek and Eric Wilson for the summer concerts and workshops in Taiwan. Mr. Peng’s teaching experience included being a sectional coach for the Dallas Youth Orchestra, and teaching cello in the Dallas Private School District. Currently, he is teaching in Richmond Music School, Delta Community School of Music, and Guildford School of Music. Mr. Peng served as the Cello teaching assistant for Mr. Eric Wilson (Cello Professor) at UBC from where he was working towards his Doctoral Degree in Cello Performance. He taught Master Classes in Shanghai, China, Taichung, Taiwan as well as at the University of B.C. for the Young Artists Experience weeks. He recently joined the music faculty of Kwantlen Polytechnical University in Langley. Mr. Peng’s students are successful in winning VYSO, DYO and Surrey Youth Orchestra auditions, RCM Exams, local and national competitions and university auditions. Bo Peng was appointed cellist of the acclaimed Borealis String Quartet in 2012.